Legal Process Outsourcing (LP0) Industry has encountered rapidly changing dynamics over the recent years, where the LPO, once dubbed as a cost-cutting exercise for the company has expanded its portfolio into an innovative and essential business model for the firms. The process has not only helped the corporate entities to minimize the costs but has also assisted them in optimizing their overall operational efficiency. The remarkable expansion of the legal process outsourcing market is clearly evident from its increasing spectrum of services which has come a long way so far, starting from litigation support, document review, e-recovery to contract drafting, compliance assistance, and patent support. Contract review service segment of the LPO industry is poised to generate a heavy business in the years ahead. The credit of this fact can be given to the huge value these M&As and contracts hold for the company, in which even a slight price trigger if neglected can have a large impact on the entire value chain of the organization. The e-discovery service is also set to offer lucrative avenues for the legal process outsourcing market globally. Digitization, which has established its roots across every industry can be quoted as the major driving factor behind the escalating LPO market trend. The electronic documents produced through digital means in an organization leads to a huge influx of data from which deriving meaningful insights can be a troublesome task for the legal in-house teams. The firms thus align these legal activities to skilled professionals via LPO which is a reasonable and efficient business model. On these grounds, this service is estimated to exhibit heavy gains in the coming seven years with a CAGR estimation of 40% over the period of 2017-2024. Europe is one of the major continents actively partaking in the legal process outsourcing industry, particularly in the onshore LPO services. 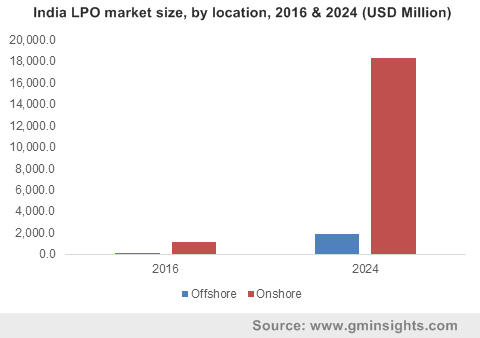 The stringent data protection law implications by the EU is lowering the demand for offshore services consequently boosting the onshore LPO market share. The onshore model is also gaining a substantial significance on grounds of it enabling a shared regulatory framework and streamlined business processes. Recently, Herbert Smith Freehills, a renowned legal firm based out of London, U.K., expanded its alternative legal service portfolio by opening a new branch in South Africa which will deal with due-diligence related tasks for the clients. This is reportedly the fourth office of the company since 2011. This event is also an instance where the company is stepping into offshore LPO market, with a brand name much sufficient to dismiss the probable data threats. This move is also sure to provide a tough competition to the other industry players such as Integreon, QuisLex, Pangea3, United Lex, and Mindcrest whose entire business model revolves around offshore LPO services. Countries such as India, South Africa, and Philippines are becoming significant grounds witnessing a substantial expansion of offshore legal process outsourcing industry. The growth in these regions can primarily be attributed to the presence of a large number of potential lawyers with a lower pay scale than those in developed economies such as the U.S. and U.K. This fact along with the favorable government norms pertaining to the LPO industry is leading to innumerable outsourcing investments in these regions. Philippines is emerging as a prominent offshore LPO service destination, credited to its low legal costs and favorable infrastructure. The LPO market’s swift expansion is quite commendable. However, the industry has always been characterized by the data security and confidentiality threats pertaining to these services. Nonetheless, the “Chinese Wall” which restricts the passage of critical information, has always been a vital part of the outsourced firms, which promises a rather profitable roadmap for the legal process outsourcing industry over the years to come. As per the estimates, the global legal process outsourcing market is slated to surpass a revenue of USD 40 billion by 2024, having had a revenue of USD 3 billion in 2016. The 35% CAGR estimation by the LPO market during the coming seven years is indeed a phenomenal one. The growth path validates the huge adoption of these services by corporate entities on a global scale, which helps the firm to implement a cost-efficient business model without jeopardizing the results for the clients.